This Eversafe 50×100 metal farm building kit comes with 4-12×12 steel framed openings and an insulated metal walkdoor but can be customized for the door sizes and locations you need. If you require a turnkey construction building price, the labor to erect the building on your concrete pad can also be quoted. We construct the highest quality steel horse barns and arenas, crop and equipment storage steel buildings, loafing sheds and dairy barns using only 100% U.S.A. made material. Farmers have trusted Eversafe for over 20 years, counting on our experience in providing the most economical and highest quality agricultural steel buildings. You can easily match the color of your existing agricultural buildings with any one of our 12 colors for the roof, walls and trim. Further customization is available adding features such as overhangs, canopies and lean-tos. We can also supply oversized doors that will fit combines, pickers and headers of all kinds. Skylights, exhaust fans, windows and several other accessories are available to meet your use and design layout. 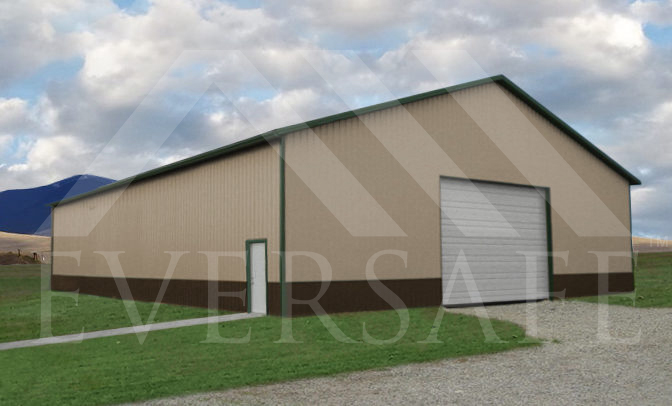 Eversafe’s agricultural steel buildings are designed to meet your local building code as well as your snow and wind loads. We provide stamped drawings from an engineer in your state making it easy for you to pull a permit if required. Eversafe’s agricultural metal buildings in Florida are designed for hurricane wind loads and the heavy snow areas throughout the northern and mountainous states. Our metal farm buildings are designed to provide a lifetime of service and remain attractive for decades to come. Call us today at 1-800-374-7106 and let us know how we can help with your next building project.